BAGHDAD, Iraq (CNN) -- A car bomb exploded Tuesday in northern Baghdad, killing at least nine people and wounding 18 others, the Iraqi Interior Ministry said. 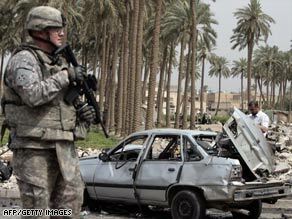 A U.S. soldier checks out the site of a car bomb attack Tuesday in a Shiite district of Baghdad. The car was parked near a mosque in a busy area of the predominantly Shiite district of Kadhimiya, a ministry official said. Most of the victims were civilians. Earlier, a roadside bomb targeting a police patrol in eastern Baghdad went off, but there were no casualties. The attacks come a day after a string of bombings killed at least 32 people and injured more than 130 in one of the bloodiest days in the capital this year. Most of those attacks were also in Shiite neighborhoods. The Iraqi government blamed the ousted Baath Party and al Qaeda in Iraq for Monday's attacks, saying they were meant to create sectarian divisions. The U.S. military also pointed the finger at al Qaeda: "The nature of the attacks and targets are consistent with past al Qaeda in Iraq attacks. We see this as a coordinated attack by terrorists against predominately Shia targets that they gauge as vulnerable to instigate sectarian violence."